When I was younger my mom used to make bread all the time. White. Wheat. Applesauce. Totally delicious. Come to think of it, Im pretty sure she still makes it but mostly for the holidays. I remember one Thanksgiving a few years back my siblings and I decided to take her fresh homemade bread and throw it in the deep fryer after the turkey was done. To say that she was less than pleased that her beloved bread was fried is a severe understatement. Side note: If you’ve never had deep fried turkey then you are seriously missing out. Anyway, for years now Ive wanted to make my own bread but didn’t want to deal with the hassle of another small appliance (i.e. bread maker) and all of the old-school recipes I had ever discovered required a lot of work for someone like me who was just in the experimenting phase. So while I was perusing Pinterest the other day I just happened to stumble upon the most brilliant idea Ive ever heard. 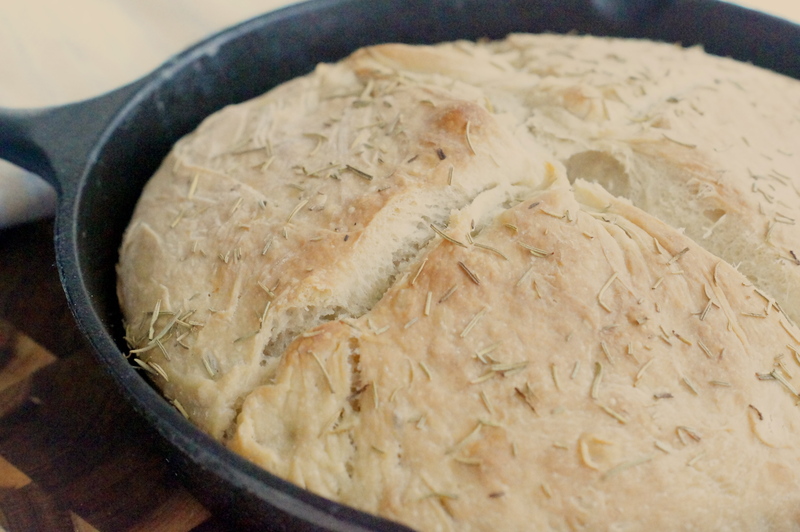 Easy no-knead bread in a cast iron skillet seemed almost too good to be true. Easy? Easy?! I like easy. Im a new mom. I NEED easy. I also like Rosemary and olive oil so I was winning all across the board that day. Here my friends, is the recipe I found. I had to give major props to the person who came up with this because it really was that easy. Mine didn’t come out as pretty; it didn’t brown as well and I didn’t have any fresh Rosemary on hand so the color as a whole was lacking a bit. I could have left it in the oven for longer to get that golden brown color but as a first time bread maker I didn’t want to take the chance of drying it out so I left it in for another five minutes. I got a little nervous when I felt the outside after pulling it out of the oven. It was a little crustier than Im familiar with on bread but that worry subsided pretty quickly when I took a knife to that baby. The warmth and aroma that busted out of that bread made me want to stand with my face over it all day long. The inside reminded me of a Focaccia bread but less compact and it was DELICIOUS. I may or may have not eaten a pretty significant portion of that loaf with a massive bowl of dipping oil. 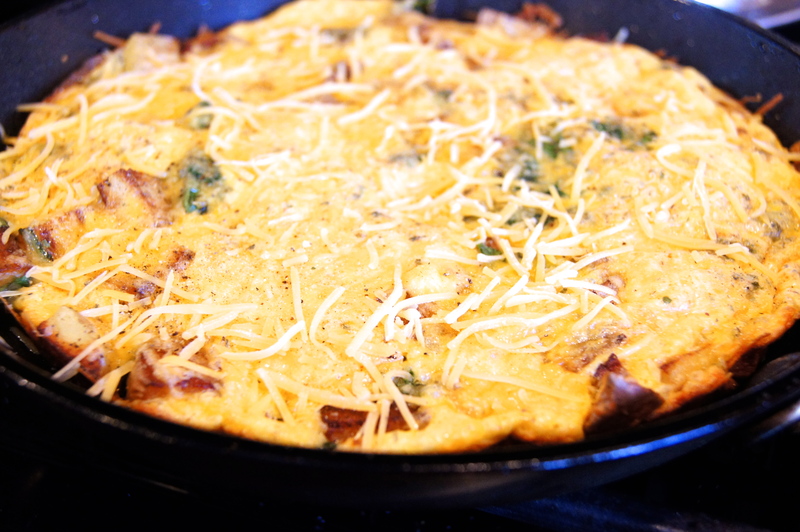 One of my favorite things to make for breakfast stems from an episode of Barefoot Contessa I watched a while back about Country French Omelettes. Let me just go off on a short tangent by saying that Food Network rocks. This isn’t a recipe for your traditional old folded omelette; it calls for a little baking action. While Ina Garten has pretty much dubbed the name and recipe as her own (if you google it, her name pops up everywhere), there are so many ways you can make it your own recipe as long as you have the basics down and its super easy. Im the kind of girl who likes to get everything I need before I start prepping and cooking, and then clean as I go, because who wants to clean a kitchen during a food coma? So I chopped all of my veggies first: shallot, garlic, potatoes. Then I mixed my eggs, milk and a 1/2 cup of the cheese and cleaned everything up. Sprinkle an oven safe skillet or pan with some olive oil and let it heat up for a minute. I used my beloved crepe pan from Crate and Barrel (here) that Ive had longer than I can remember, but any pan is good as long as you can throw it in the oven without the risk of any parts burning or melting off. When the pan is good and hot, throw in the diced potatoes and cook until brown. They don’t have to be completely soft because they’ll finish cooking in the oven. Throw in the shallots, garlic and spinach. You can use any vegetable you want (broccoli or leeks are a great option too!) 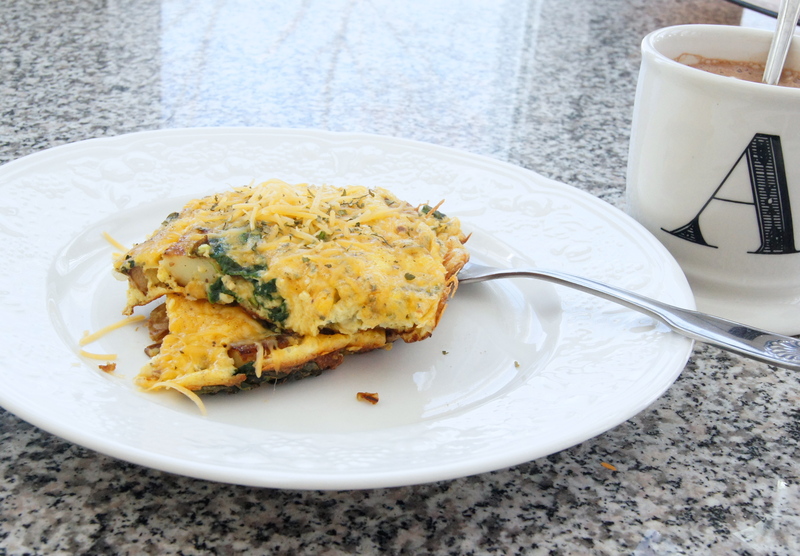 but Im a little obsessed with spinach and eat it almost every day so I obviously had to make an omelette with it. And you’re probably wondering why theres no bacon. Well. There would be bacon, but we spaced at the store the other day and came home without it. You tend to forget a lot of things when you’re new parents. A lot of very important things. Like bacon. Once the spinach is just cooked, pour in the egg mixture evenly over all of the veggies and cook until the edges start pulling away from the sides of the pan, then spread the top of the mixture with the other 1/2 cup of shredded cheese, sprinkle with the paprika, parsley, salt and pepper and throw the pan uncovered in a 350 degree oven for 8-10 minutes. Jason teases me that half of the omelette will probably end up in the trash because most of the time I eat like a bird, but I can tell you that this is one thing I can easily devour on my own. I usually eat half of it in one sitting its so good! We use it at the beginning of every week to put together our food shopping list. With all of the downright craziness in our lives, it’s hard to sit and figure out what we really want for dinner the nights that Jason is home. For that, I love. Then theres all the other free hours, minutes and seconds of the week when I get completely sucked into the world of dream closets, DIY’s and super adorable must-have baby products and before I know it, I’m whipping out my credit card and burning yet another hole in my bank account. I love and hate that. Okay, so the spending isn’t that bad, but it sometimes feels like it is. I suppose I should wait to feel bad when Jason starts saying something about it. Ha. This time, I’ve been paying particular attention to the food boards and fueling my inner cookie monster. I find it totally weird that I’m more hungry with more bizarre cravings than ever now than when I was pregnant. 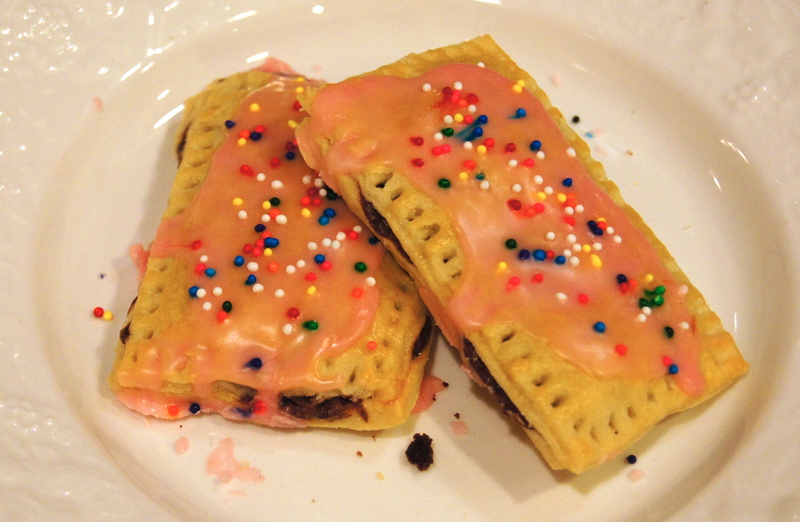 So when I stumbled upon a pin for homemade pop tarts, I may or may not have pinned it more than once. Check out this recipe by Smitten Kitchen. Pop tarts always make me chuckle a little for the sole reason that when we were younger, for whatever reason, my brother used to pronounce them as “parp tart”. Come to think of it, I think he still does. And you don’t have to make him say it five times fast! Anyway, I usually stick straight to the recipe when Im making things for the first time, then if it comes out as nothing special, I’ll tweak it to my liking. However, I did tweak this one a smidge. For example, a tablespoon of sugar turned into a heaping tablespoon and a teaspoon of vanilla extract just makes everything better. As a girl who orders a white mocha with 2 pumps of caramel, 2 raw sugars and a huge handful of vanilla powder on the regular, Im no stranger to sweet. I like sweet. I made two batches; one with nutella filling and the second with chocolate. See? SAAA-WEET. 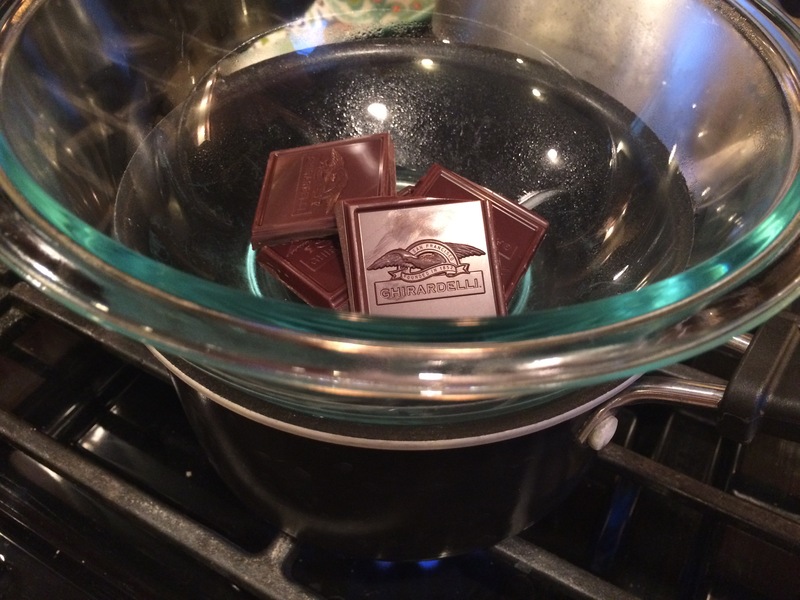 I always opt for the Ghirardelli baking bars when I make anything chocolate and these I melted in a double boiler with a little butter. The dough is the usual song and dance…flour, sugar, salt and extra cold butter. I stash sticks of unsalted butter in my fridge like theres no tomorrow, but I threw a couple of sticks in the freezer to make them easier to dice. And into the food processor everything went. Of course, I could have just hand mixed this myself, but theres a high I get when I pulse food with a super sharp, super fast blade. I find myself fishing for excuses to use it for everything. It makes food prep so easy! In the spirit of the impending spring season (come onnnnnnnn Spring!) 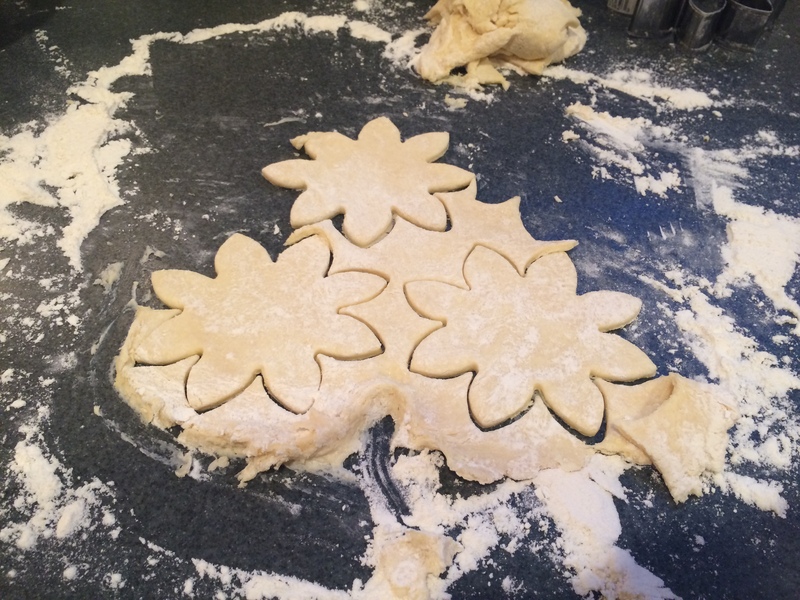 I whipped out my flower cookie cutter because you know, I thought flower shaped pop tarts would be AWESOME. The flowers were hard to assemble and ended up falling apart or looking like a big mound of yuck, so I settled for the traditional rectangular tarts and they came out adorable! These are about half the size of the store bought Pop Tarts so with that comes half the guilt of eating one! The glaze is super simple to make too. I mixed 2 parts powdered sugar to 1 part water and added the tiniest drop of red food coloring. They can be enjoyed at room temperature, but I prefer popping (get it?) them in the toaster oven for a few minutes. Ive already had three. Im obviously not sleeping tonight so I may as well cruise the pin boards for some more yummy recipes. Or baby stuff.